Inform and educate the Canadian public about current firearm laws and regulations and their effect on our society. Provide support and accurate information to media and government concerning firearm issues, policies and regulations including social impacts. Promote human rights in Canada as they apply to defense of persons and property rights. Promote in an inclusive nature, all firearm related activities and culture in Canada. 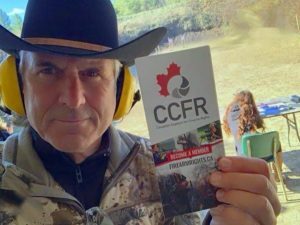 The CCFR has grown into Canada’s most effective and recognizable firearm rights organization. We host Canada’s only in-house registered lobbyist, specializing solely on the firearms file with politicians at all levels of government. You can count on the CCFR to be your voice in Ottawa. Gun owners have suffered 30 years of bad branding in the media as well, which is why having sophisticated, professional, respected advocates is making all the difference for our image. We are the public relations experts in the firearms community. ~Jim Shockey, professional big game outfitter and television producer and host for many hunting shows. Shockey is the producer and host of Jim Shockey’s Hunting Adventures and Jim Shockey’s Uncharted on Outdoor Channel and Jim Shockey’s “The Professionals” on Outdoor Channel and Sportsman Channel. He is an active member of the Canadian Armed Forces (CAF), serving the rank Honorary Lieutenant-Colonel (HLCol) of the 4th Canadian Ranger Patrol Group. His hunting adventures have spanned six continents and 50 countries, and he has taken over 367 big game species. Shockey has been called by Outdoor Life magazine “the most accomplished big-game hunter of the modern era, having taken arguably the most free-range big game species by any living hunter.” They also noted that he is “the most influential celebrity in big-game hunting.